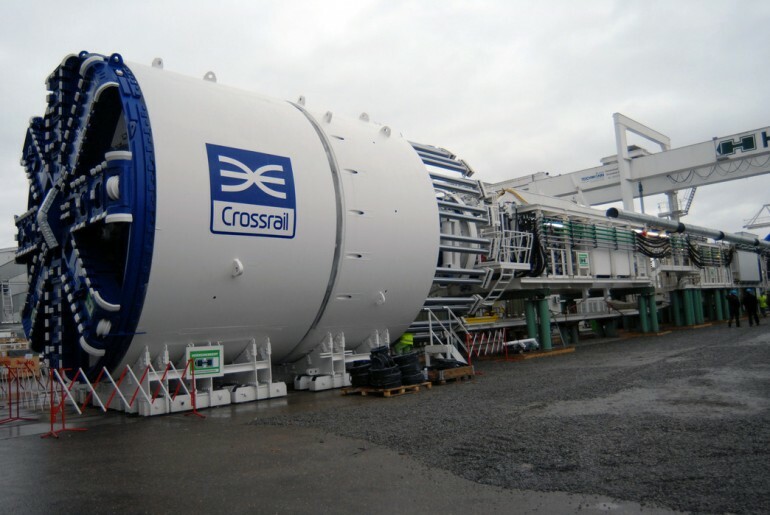 Crossrail competition asks public to name our last two tunnelling machines - Crossrail . For information about the Elizabeth line please visit the Transport for London website. Crossrail has today asked the public to nominate their ‘modern day heroes’ as part of a naming competition for the final two tunnelling machines to be used to build the Crossrail route beneath London. A total of eight Tunnel Boring Machines (TBMs) will be used to build 26 miles (42km) of tunnels beneath London to form the central section of the Crossrail route. The naming of TBMs after women is a long-held tunnelling tradition and the names of Crossrail’s first six TBMs were each inspired by British heritage and history – tunnelling machines Ada and Phyllis in west London named after early computer scientist Ada Lovelace and Phyllis Pearsall who created the London A-Z; Elizabeth and Victoria in east London, named after Queen Victoria and Queen Elizabeth II; and Mary and Sophia in southeast London, named after the wives of famous railway engineers Isambard Kingdom Brunel and Marc Isambard Brunel. For the final two tunnelling machines Crossrail is looking ahead to the modern day, recognising the state-of-the-art new transport links being delivered for current and future generations. To help name the final two TBMs, the public are asked to nominate their ‘modern day heroes’ and inspirational women. Fittingly, Crossrail’s remaining tunnelling machines will be launched from Pudding Mill Lane close to the Olympic Park - the setting for a number of heroes at the London 2012 Olympic and Paralympic Games such as Gold-medal winners Jessica Ennis, Ellie Simmonds, Laura Trott and Sarah Storey. The tunnelling machine naming competition is now open for people to nominate names at www.crossrail.co.uk/tbmnamingcomp. The public nomination process will run for 5 weeks, closing on Friday 31st May when a final shortlist of names will be selected. Crossrail workers, including those who will work on the final two tunnelling machines, will then choose two winning names from the shortlisted public nominations. The winning names will be announced in the summer and etched onto the side of the two machines before they are launched on their tunnelling journey later this summer. Along with the public nomination process, Crossrail is working with two local schools in east London where the final two tunnelling machines will pass through. Tunnelling contractor Dragados Sisk (DSJV) is arranging activity in Carpenters Primary School in Stratford and Ben Jonson Primary School in Tower Hamlets. Pupils at both schools will be asked to come up with their own ‘modern day heroes’ as naming suggestions for the Crossrail tunnelling machines. The names suggested by the local schoolchildren will then be included along with public suggestions in the shortlist for Crossrail workers to choose the winners from. The final two tunnelling machines will be used in Crossrail’s tunnelling drive from Pudding Mill Lane, near Stratford in east London. The machines will create 2.7km of tunnels beneath east London to Stepney Green, helping link the surface railway from Shenfield in Essex, through Stratford Station, into the central tunnelled section of the new Crossrail route.